Posted on October 8, 2015, in Messenger, News, Skype. Bookmark the permalink. 14 Comments. I don’t believe this app will not be “finished” (which I would argue would be considered feature-parity with the current Skype desktop version) for many many years. However, although I haven’t looked through the protocol part yet, but I can fairly confidently say that there’s no dependencies with MSNP21 here. MSNP21 and this app just aren’t related in any way. One thing that does appear to use some MSNP21 dependencies is OneDrive, as it contains the non-Skype version of the Web Messenger as well as supporting the Messenger groups’ shared space. This shared space has been announced to be shutting down October 16th. What that will mean for Messenger and MSNP21, I’m not sure. I think its obvious what is going to mean for msnp21. Most likely the end of WLM, like i said earlier this year. Sad to hearing that. Except there are more depedencies from other product(s), Microsoft has no reason to keep alive the MSNP21 protocol. Skype using MSNP24, I think the new Messaging app too. Even the old Messaging app in Windows 8 used/using different (if I remember correctly it was based on MSNP22). Plus officially the WLM era was ended more than 2 years ago. “é as vêrções mais recentes do windows estão décrinado com muitos pobremas, e os ápricativos feito para ele ..ou melhor esta janela tánbem paresce não gostar muito dele e o estão rejeitando, e por conseguinte eu tenho a atualização do 10 mais tenho usado muito o sevem ultimate que ainda é o melhor. Help me please. How to sign out from this app? Yesterday I tried it out, then shut down my PC. Today evening one of my friend stated that I remained logged in during the entire day. Is there a way to sign out? I noticed this too, even after many days of not using it, it’s still signed in. Then sign into your account using Windows Live Messenger and use the “Sign out from everywhere” option. I’m having a problem with WLM (started a few days ago). I can sign in fine but I’m not displayed as signed in to my contacts (I appear offline to them while appearing online to myself) and any messages I send to my contacts or receive from them do not go through. I effectively can’t communicate with anyone (can’t send or receive messages). I know for a fact it’s not me because I had one of my contacts (who’s running WLM 2012 + Reviver just like me) sit down right next to me and we both signed in just fine but appeared as offline on each other’s msn interface. Neither of us received any messages when we tried to send a message to the “offline” contact. Is there anything you can do about this Jonathan? It seems, you can log out using the Skype Video app and then the sign out option. This app is a bad joke. mes quel application il faut préssiser parce que si c’est windows live messenger 2012 il fonctionne trés bien et donc ce n’est pas une mauvaise blague. 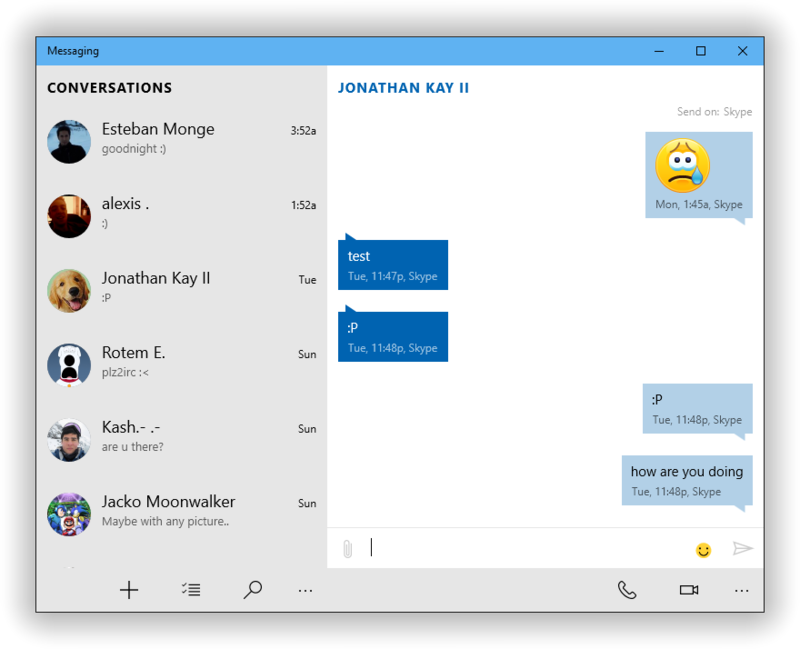 The new Skype UWP preview and the Messaging apps are even worse than this. I’m afraid after they shut down the MSNP21 protocol and finally kills WLM, I won’t use their service anymore.